Hey kids, what’s with the middle finger!!! I have a thirteen year old. She is a contemporary. She has diverse interests, and also mainstream addictions with her mobile phone and apps like Instagram and Facebook, and lots I can’t recall. Last night she hosted her first party. Yes, she’s had lots of birthday parties, but most of them included lots of parents, lots of entertainment in the form of clowns, pets, rides or bouncy castles. This was her first party where none of these would factor. We did hire a great DJ, but otherwise it was all very simple. They had a fantastic time. She invited 70 boys and girls, who stood around sheepishly in their respective gender corners for about an hour, and then miraculously merged into a sea of dancing bodies for another two and a half hours. There was lots of soft drinks, pizzas and junk food. Perfect combination for sugar zealots. Parents were not asked to join in, but to stay a safe distance in the front of the house. She melted into her bed afterwards with a smile stamped on her face. This mum was pleased. This morning we perused her photos. There were over 800 taken (phew!). Most of the photos were of happy faces. Young teens enjoying themselves without a care in the world. 450 of these photos made their way to a Facebook album. 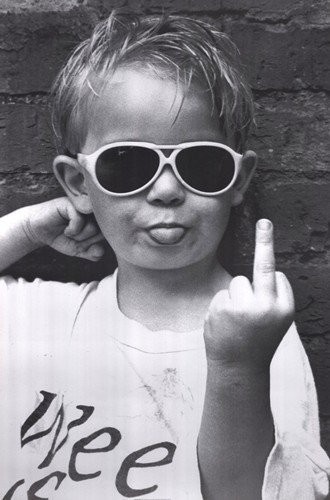 But why, oh why, do these kids need to stick their middle finger up for the photos? I know these kids. I see them every day. Not once have I seen them strike these gestures out in the street. Nor when they meet each other, nor when they speak with anyone for that matter. I didn’t see them use this gesture amongst themselves during the party. And yet, one in every four photos included that dreaded middle finger. Most often it was the boys doing so, and yet, there were a few girls who repeatedly offered it up too. I got to thinking what is it that makes people, including kids, behave like this. The correct etiquette is obvious… but just in case, it should never, under any circumstance be done. Or should it? 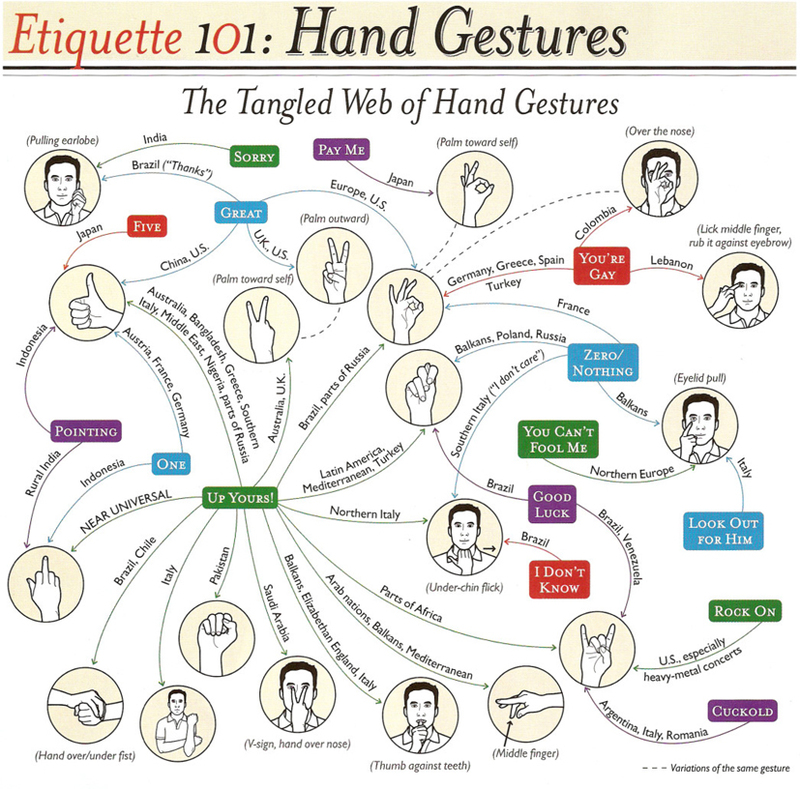 On further research, I started looking at various hand gestures, and which ones are acceptable, which one’s aren’t. As with most rules of etiquette, it really depends on culture and geography. It’s quite amazing how many gestures have more than one meaning. Above image taken from a past issue of Conde Naste Traveller’s magazine. I’ve discussed this with my children at length. I’ve explained to them that gestures like these are disrespectful. It is likely that most people make these gestures after being provoked. But, nevertheless, it’s much more appropriate to remain silent. Silence has much more impact. It also gives you time to gather your wits, and if necessary speak more specific and deliberate words.